As a self-proclaimed Twitter fiend, I like to tweet my thoughts and ramblings both at home and on the go. I used to just text my tweets to Twitter; soon, however, I discovered that I was missing out on a ton of high-quality tweets and conversations from the people I followed, since I couldn’t view the Twitter Newsfeed via text message and I wasn’t a huge fan of the Twitter mobile website. Thus I set out in search of a worthy Twitter Android app that would serve as my new way to tweet on the go. Now that I've used some of the most popular (and free) Twitter apps in the Android Market, here is my evaluation of how each one works. 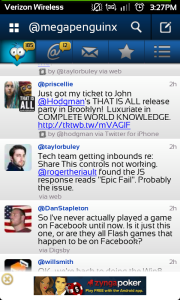 Plume for Twitter is a great-looking app, but it can be a little confusing to navigate at first. Panes slide in and out of view, and you can easily click a link by accident, when you meant to reply to a tweet. Still, once you master the unusual layout, getting around the app is a snap. Like TweetDeck (reviewed below), Plume separates your Twitter account into various columns: Newsfeed, @Replies, and Direct Messages. Plume allows you to manage multiple Twitter accounts, but unfortunately it doesn’t support other social networks. 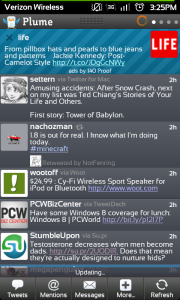 I like Plume a bit more than the official Twitter app, but it lacks some of the elegance of TweetDeck. A premium version, available for about $3, will remove the occasional ad that appears in your Twitter Newsfeed. Personally, I didn’t find the ads too obtrusive. Similar to TweetDeck (reviewed below), Seesmic allows you to update multiple social media accounts at once: Aside from Twitter, you can also check your Facebook, Google Buzz, or Salesforce feeds. However, although it supports other social networks, Seesmic really works well only as a Twitter client. Facebook and Google Buzz images come out tiny and grainy, and switching between different accounts isn’t as fluid as it is on TweetDeck. As with the official Twitter app, Seesmic’s greatest strength lies in its simplicity. Quickly posting a picture or status is easy, and you can rapidly scroll through your Newsfeed to find interesting tweets or updates. 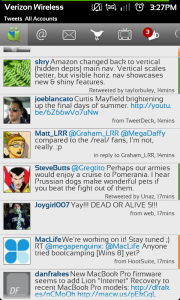 With a very cartoony look and feel, Tweetcaster is an excellent app for Twitter fanatics. 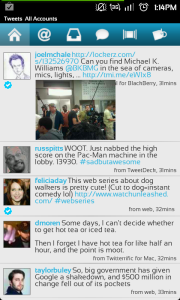 Tweetcaster comes in a free version and a $5 Pro version. Though the two editions perform the same, the Pro version omits a small, annoying ad at the bottom of the Newsfeed. If you use the free version, you can manually close the ad or pay to upgrade to the non-ad-supported version. One of the best features of Tweetcaster is its ability to “zip” tweets. Zipping tweets allows you to hide the tweets of specific people, without having to unfollow them. I use this feature a ton whenever a friend begins tweeting like a madman and floods my feed; instead of unfollowing him, I just zip his tweets until the storm subsides. Tweetcaster supports making updates to Facebook--but in order to connect your Facebook account to Tweetcaster, you must first add a Twitter account, compose a tweet, and then tap the Facebook icon that appears, thereby signing in. A little odd, but at least the option exists for anyone who wants it. Arguably one of the most popular Twitter clients on any platform, TweetDeck is a delight to use on Android. TweetDeck is extremely easy to set up, and you can manage and update your Twitter, Facebook, Foursquare, and Google Buzz accounts from within the app. If you’ve never used TweetDeck, here’s how it works: You have multiple columns (Newsfeed, @Replies, Direct Messages, etc.) and you can add more based on your lists or specific hashtags. 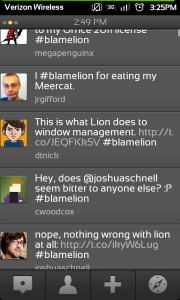 One thing I really like about TweetDeck is that you can adjust each column to update at different intervals. This feature is useful if, like me, you send a lot of Direct Messages in Twitter and want to be able to reply quickly. Regrettably the TweetDeck mobile app lacks the ability to schedule posts, something the desktop version is known for. Although it would be nice for TweetDeck to include that functionality in a future update, right now it’s not much of a deal breaker considering how well the app performs its job otherwise. Though it was replaced by UberSocial, Twidroyd was one of the first Twitter clients for Android--and it remains today in the form of a legacy app. The app will no longer receive updates, but it is still available for people to download and use. Twidroyd is by no means a looker; the overall design is very reminiscent of the Android 1.6 days. But it’s hard to beat an app that just works (even if it is a bit ugly to look at). In all the years I’ve used it, Twidroyd has never failed at posting a tweet (something I wish I could say for the official Twitter app) or refreshing in a timely manner. The app lets you tweet from multiple Twitter accounts, and everything is organized in a way that makes getting around easy. It may be the dinosaur of the bunch, but it’s one of the more reliable Twitter clients I’ve used. If you ever need a straightforward Twitter app with no bells and whistles, look no further than the official Twitter app on Android. Though it lacks a clean interface like that of TweetDeck or UberSocial, the official Twitter app gets the job done right. You can tweet images or video, and the app merges seamlessly with the rest of the OS. You can even sync your Twitter contacts with those on your phone for easier access. One minor annoyance I've encountered is that sometimes the app can take multiple tries to refresh your Newsfeed, even in an area with good coverage. Regardless, if you want a plain and simple way to tweet on the go, it’s hard to beat the official Twitter app. Formerly Twidroyd, UberSocial can be intimidating to new users. The app is so jam-packed with features that it can be a bit of a mess to navigate. The scrolling “Uberbar” at the top of the screen features everything from your @Replies to Groupon-style deals in your area. If you tend to get a bit wordy with your tweets, UberSocial includes a “tweet-shrinking” service, replacing tweets that exceed 140 characters with a link that takes readers to the full-length tweet. Found a link, but don’t want to leave the app? No problem: UberSocial has a live preview function that allows you to view links from within the app itself. If you don’t like the look of UberSocial, or if you get tired of it, you can find a handful of themes in the Android Market that will change the look and feel of the app. UberSocial is a great choice for anyone in need of more than just a plain old Twitter client.